Offer free WiFi to your customers with a limit per device per day. No staff intervention required, no need to print vouchers, this feature is fully automated and very easy to use. Time limits*, data limits*, bandwidth (speed) limits (or a combination of) can be enabled for free WiFi, once any time or data limit are reached your customers can either wait until tomorrow or they can purchase additional access. Limits renew every night at 12am, this can also be changed to any time you require for example Hotel checkout time. Login hours can be set, for example Cafe operating hours, this ensures customers are only accessing your free WiFi when your business is open. You may also set a common password and display this in your establishment eg on a chalk board, this helps prevent people from accessing your Free WiFi without first entering your establishment. * Time limits of 2 hours or more, and data limits of 200MB or more require a license, please refer to our licensing page. Promote your Facebook and Trip Advisor pages via WiFi. When your customers have logged in, you can choose to display options enabling them to like you on Facebook or rate you on Trip Advisor. Print or export vouchers ready to hand out to customers. Each voucher contains a unique access code required for accessing WiFi. 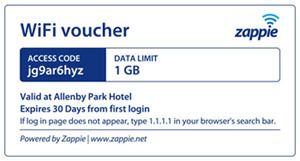 Time limits, data limits*, expiry dates*, bandwidth (speed) limits (or a combination of) can be set for each voucher. Vouchers are generated using the operators control panel which will output either a PDF or a CSV file. PDF files can be printed out with ease on any A4 printer, while CSV files can be used to import access codes directly into your point of sale or hotel booking system ready to print out on customer receipts. No limit on the number of vouchers you can generate, you are free to generate as many as you need and sell these to your customers at any price you like, or even give them away free. * Expiry dates of 8 days or more, and data limits of 3GB or more require a license, please refer to our licensing page. Give your staff, friends, or family or whomever you wish access to your WiFi zone. User accounts can either be created using the operators control panel or by the users themselves via the WiFi sign-up form. User accounts can be assigned specific privileges or data limits*, bandwidth (speed) limits or can operate on a prepaid basis requiring credit card topup. Privileges you can assign to users include unlimited WiFi access, monthly or weekly data limits with option to change the rollover day, or even assign them as an additional operator. User accounts also support MAC Authentication which can be used to login multiple devices automatically from their MAC addresses, the captive portal (WiFi login page) will not show unless the account has insufficient data or credit remaining, at which point the user will be asked to top-up using a crdit card. * Data limits of 3GB or more require a license, please refer to our licensing page. Secure WPA2 enterprise authentication fully automates the login process and provides a secure encrypted channel from the users device to the Zappie hotspot gateway. Works with all Zappie user accounts, users simply look for "Zappie Secure" in their wifi network settings then enter their username and password when prompted. Automatically connect and login at any Zappie WiFi Zone where the network "Zappie Secure" is present and in range. The captive portal (WiFi login page) will not show unless the account has insufficient data or credit remaining, at which point the user will be prompted to top-up. We take care of all online credit card payments and refunds, protect you against any chargebacks and guarantee all revenue generated. Set your own currency and charged data rate which customers will pay for WiFi data when accessing your WiFi zone. We will pay you out on a monthly basis half the cost of each megabyte used when your accumilated balance is $20.00 or more. Fully automates your hotspot, great option to use in conjunction with our Free WiFi option. Once people have used their free WiFi allowance, they have the option to purchase additional at the rate you specify.